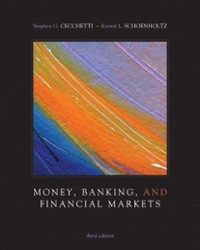 Money, Banking and Financial Markets 4 Edition Cecchetti & Schoenholtz's Money, Banking, and Financial Markets stays relevant and interesting through the text's unique emphasis on the Five Core Principles, the early introduction of risk, an integrated global perspective, and the integration of FRED data in the text and problem material. By focusing on the big picture via core principles, Cecchetti & Schoenholtz teaches students the rationale for financial rules and institutional structure so that even when the financial system evolves, students' knowledge will not be out of date. Be sure to visit the author blog at www.moneyandbanking.com for short, informed discussions on issues in the news, as well as technical points relevant for instructors and students alike.Connect is the only integrated learning system that empowers students by continuously adapting to deliver precisely what they need, when they need it, and how they need it, so that your class time is more engaging and effective.